Crossing the Borders of Time is a grand, sweeping story, combining history and tragedy with romance, and to top it off it’s nonfiction. 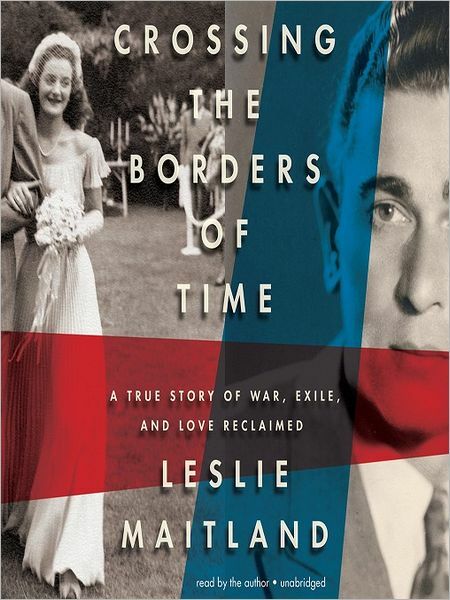 Leslie Maitland grew up with the legend of her mother Janine’s great love, a man named Roland that she had to leave as a teen during World War II, when as a Jew she fled Europe with her family for the United States by way of Cuba. Roland was a French Catholic and had to stay behind, but the young couple pledged to marry as soon as they could. Janine’s family cooperated with the war to keep the two apart until Janine married an American man and had two children; her troubled marriage weathered several storms, but she always remembered Roland wistfully. As the book opens, Leslie’s father Len is dying, as Leslie heads off with trepidation on a journey to find the lost Roland and give her mother another chance at love. The author reads this audio version herself – a phenomenon with which I have had 100% success, continued here with Leslie’s own heartfelt recollections, and her relation of Janine and Roland’s stories complete with the French and German (and Spanish) accents that season their lives. The iPod can be misleading when it comes to audiobooks. I don’t even remember loading this one into my gadget, and I certainly hadn’t remembered its length, so I was surprised as it unfolded into no fewer than 15 discs’ worth, about 19 hours. However, it was well worth the time spent. Maitland makes no pretense about the romance of this story – that is, that it is a love story, but also that she approached with a sense of romance, despite her training as a journalist. She occasionally has to stop herself and try to pull back, and question whether she’s behaving rationally, as she searches for the mythologized Roland. But this is a personal matter rather than a professional one, and it’s no surprise that she feels strongly, having grown up hearing about her mother’s first love. Nevertheless, much of the tale is told in flashback, and in journalistic style, as Maitland reports the lives of her forbears: her great-grandparents Simon and Jeanette; her grandparents, Sigmar and Alice; and Janine, born Johanna (Hanna or Hannele) in German-held Alsace. As Alsace exchanged hands between France and Germany over the years, so Janine/Hanna struggled to define herself, as her parents’ first escape from Nazi Germany takes them just over the border from Freiburg into the French town of Mulhouse where she first met Roland. She would call herself French rather than German from that point forward. As Maitland’s story reaches her own era, her first-person voice reappears: she tells us her own perspective on her parents’ marriage, how distant her father, how conflicted her feelings about that beloved parent when he leaves for another woman and then comes back home again. When the narrative fully inhabits the modern day and Maitland’s own perceptions, the pace picks up; what has been a history becomes a race against time as Janine ages and Roland remains elusive. Perhaps it is not too much of a spoiler to say that he is finally located; as a coworker of mine pointed out, there likely would not have been a book if Maitland had been unable to find him. But the final fates of our romantic hero and heroine are not straightforward, so you’ll still have to read the book to find out how it all concludes! One of the greatest strengths of Crossing the Borders of Time has to be Maitland’s tone. I appreciated the air of nostalgia that permeates her telling of Janine’s history before and during the war; she combines journalistic style (citing sources, noting the odd inconsistency, describing an interviewee) with the emotional daughter searching for her mother’s legend. And if she lapses into the sentimental and romantic as things draw to a close, I don’t think she owes us an apology; I found this voice compelling and convincing, and entertaining. Narrative nonfiction with emotion, but also a commitment to truth, always makes for a fine way to learn history. I found this an enjoyable, evocative, feeling story.